El carro pesado IS-1 (IS-85) fue una modernización a conciencia del KV-1. El carro poseía el cañón 85-mm D-5T. El IS-1 entró en la producción en masa en octubre de 1943, pero se abandonaron los trabajos a primeros de 1944, ya que el IS-2 (IS-122) entró en la producción en masa en diciembre de 1943. Se fabricaron un total de 107 vehículos. It is the first of the Iosef Stalin class tanks available to the player. The IS represents both the IS-2 and the early model IS-1. The stock tank is the IS-1, equipped with the 85mm gun also available on the KV-1S. The IS is a continuation of the KV-1S and will thus feel very similar in terms of agility and speed. When equipped with a 122mm gun, it technically becomes an IS-2, which will feel much more potent when engaging other heavies. Like most Soviet heavy tanks, the IS fares much better engaging enemies at close range where the IS can hug cover and back off when it is reloading. Thus, the IS is better for maps such as Middleburg where there are mostly close-quarters fighting and no big open areas. The frontal armor on the IS is decent enough to bounce a lot of shots from lower tiers and is surprisingly bouncy even towards other tier 7 tanks and higher tier tanks if you angle the tank properly. Play this tank smartly, hit your enemy, pull back to reload and hit your enemy again. You will find yourself doing massive amounts of damage to the enemy and if you play this tank properly, you can really help your team a lot. Very mobile for a heavy tank, especially with the upgraded engine. Agile enough to act as a decent flanker in emergencies. Under-average penetration for tier 7 heavy tank. The design philosophy for the IS shifted somewhat away from heavy armor plating towards increased mobility. As a result, the IS is one of the more maneuverable heavy tanks with a top speed of around 36km/h. The stock 85mm gun is a joke and should be replaced as soon as possible. Against equal or higher tier enemies, most players play the IS as if it was a medium tank and supporting friendly heavy tanks that have heavier armor. While not quite fast enough to flank enemy tanks on a regular basis, this tank is terrific for "peek-a-boo" maneuvers from behind cover. On paper the stats for the second 122mm gun don't appear much better than the first 122mm, but the increased firing rate often makes the difference between dying and getting that last kill shot in on the enemy you're facing. Against higher tier heavy tanks and tank destroyers, the 122's impressive damage is often greatly reduced by the enemy's armor, if it penetrates at all. In these situations, switch to a target with weaker armor if possible. Many low tier tanks fear the IS due to its capability to one shot some lower tier tanks. It has one of the highest "Fear Factor" among the tier 7 heavies. For a more medium tank play-style (being somewhat of a heavy medium anyway) using the 100mm D10T gun might be preferential. It does do less alpha damage then the 122's, but it has better DPM, better accuracy and a better aim time, making a great scout-killer gun that can also engage at longer range then the 122's. Be aware that the T-44 tier 8 medium uses a similar gun as its top gun, a tier higher. Also, the credit cost per round is only a quarter that of the 122's, making it more profitable to use, which in turn makes grinding more enjoyable. You must keep in mind, perpetually, that there is very bad matchmaking for this tank, with a lot of higher tier matches, so you need to know that there is no alternative play-style for higher tier battles on this tank, it's just, simply put, a point-blank brawler. There will be numerous bounces at tier 8, for any sort of semblance to what havoc it should technically be capable of wreaking, you need to fight at point-blank range, and make sure you aren't hit. Keep some APCR in the rack for such cases. The best possible tactic would probably, in most cases, to go around, dart from cover to cover, then, when they 're all fighting your more powerful team-mates, go around behind to sting them! As far as your armor is concerned at this level, it is butter, and it is of utmost necessity to stay out of harms way. The fact is, their top heavies will kill you in 3-4 shots, and their top tank destroyers chew through 2/3 of your health in 1 shot. At this tier, you are pretty much an EXP pinata. In short, like the KV-1S preceding it, its attributes that stand out for a heavy tank are its gun and its mobility, you should put them to good use in the higher tier matches to survive. Fortunately, its successors will remedy this issue with their pike hulls. All in all, the IS is not a typical heavy tank, and should not be played as an assault tank. Instead, it is an opportunist brawler. As such, it is a monster in tier VII matches and still a force to be reckoned with in tier VIII. Drive the IS to the heart of the battle, look for moments to strike with big damage and this tank will show why it is a contender for best Tier VII heavy tank. Unfortunately the only usable module that carries over from the KV-1S is the 122 mm D-2-5T gun, and it is not immediately usable, so you have to fight stock for a while (that is, unless you unlocked the 85 mm D5T-85BM via the medium line). Your first step should be to research the 2nd turret in order to mount the 122 mm D-2-5T (the 1st 122mm). Alternatively you could research the 100 mm D10T. Next the tracks are good for the increased traverse speed and because the engine costs so much more. Note the V-2-54IS engine, and the 122 mm D-25T gun are also upgrades on the IS-3, the more you research here, the better later, as many modules will carry over. 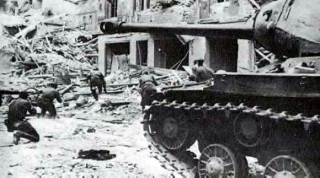 The IS ("Iosef Stalin"), with its 122mm gun, was an unpleasant surprise for the Germans. Produced from October, 1943, through June, 1945, with a total of 3,483 IS-2 and 107 IS-1. In the beginning of Operation Barbarossa, the KV was the Soviet's Heavy tank. German tanks of the time had difficulties engaging it, but after the Tiger appeared, the heavy KV proved inadequate. The tank was heavy, but poorly armed with the same gun as the much more mobile T-34 medium tank. Thus, a replacement was ordered. N.V. Tseits, recently released from a GULag, was appointed head designer of the new project. The project first led to the KV-13 universal tank, which was supposed to have medium weight and heavy protection, with both turret and hull protected by cast armor. By sacrificing internal space, consumption of materials were minimized for a given armor protection, following instructions of the State Defense Committee's decree of 1942. The KV-13 was equipped with a 600hp engine, capable of reaching speeds up to 55 km/h, and used parts from both the T-34 and the KV. However, acceleration was poor and the tank suffered severe reliability problems. Despite improvements, the Soviet military lost interest in the project. Despite this, the Experimental Tank Factory continued research and testing, led by N.F. Shamshuring after the death of Tseits. The design was now more based on the KV-1S. After the appearance of the German heavy Tiger tanks, the speed of development was increased and orders were placed for two Iosef Stalin (IS) prototypes, based on the design of the KV-13. 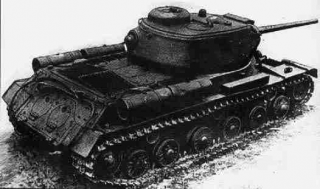 One of the prototypes, the IS-1 (factory designation: Object No.233), was armed with a 76.2mm gun, the other, the IS-2 (factory designation: Object No.234) was armed with the 122mm U-11 howitzer. Both tanks had better armor protection, a higher speed and equal or better armament than the KV-1S. Problems with the engine and transmission were solved while factories prepared for the production of the new vehicles. After the first data about the German Tiger tank became available, it turned out that the 85mm AA-gun 52-K model 1939 was the most effective against its armor. It could penetrate the 100mm frontal armor from 1000m. New 85mm guns based on the 52-K model were developed, the D-5T gun ultimately being the chosen gun for further development. The IS-1 was ordered into production, together with an order for the development of an IS with a 122mm gun, based on the 122mm Field Cannon A-19 Model 1931, which proved to be the most effective anti-tank gun in the battle of Kursk. During tests, the 122mm was able to throw a Panther several meters back with a penetrating shot in its side armor. Other tests were done with a 100mm gun, but this gun was not available in large numbers and ultimately scrapped. The first IS-1s (85mm) were produced in October 1943, the first IS-2s (122mm) in December. 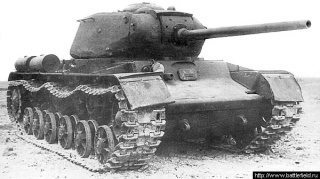 Production of the IS-1 was quickly stopped in January 1944, in favor of the IS-2. Only 107 IS-1s would be produced. In combat, the 122mm with regular sharp-nosed APHE ammunition, did not prove to be very effective against Tigers (penetration from 1200 meters) and the sloped Panthers (penetration from 600-700 meters). Soviet designers noticed that the blunt-nosed HE ammunition was much more effective against sloped armor. It caused cracking of the armor and could tear off the whole front armor plate at the seam weld. However, in 1944 the problems of the APHE round also disappeared as the German tanks decreased in armor quality due to lack of materials and the Soviet ammunition improved in quality. The IS-2 also improved in quality: from 1944 onwards, the front armor was tempered to a very high hardness, leading to better protection, but higher production costs. Despite this, the armor protection of the IS-2 was still lower than expected: a Soviet 76.2 mm Gun ZiS-3 could penetrate it from all sides at a distance of 600-700 meters. Not all shots penetrated, but the impacts also caused armor splintering and fragmentation inside the turret. As a result, many many ISs were lost during the winter and spring of 1944. Further modifications meant the German 88mm guns could not penetrate its front armor at point-blank range from an angle of 30 degrees. The turret could not be further modified. The 122mm already caused major imbalances (as the turret was designed for the 85mm gun) and increased armor would result in even more problems. Some smaller improvements to the turret led to an AA-gun and an improved periscope. Soviet tank doctrine focused on only two tanks, the Medium T-34 tank and successors, and the Heavy IS-2 tank. In total 3,483 IS-2s and 107 IS-1s were produced. Afterwards, production shifted to its successors, the IS-3 and IS-4. 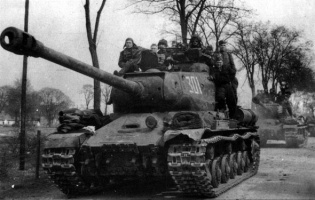 The IS-2 tank was designed as a breakthrough tank and proved very effective during the course of the war. The separate breakthrough regiments, previously equipped with KV tanks, could field the new tanks from February 1944 onwards, receiving the "Guards" status in the process. Each regiment of 375 men in total consisted of 21 tanks (4 companies of 5 tanks and a commander tank), a SMG infantry company (riding on the tank), an anti-aircraft battery, a sapper platoon, a medical platoon, and a signal platoon. The tank crew was, due to formations of new regiments, partly inexperienced. Each tank had four crew members: two lieutenants (the tank commander and the driver) and two sergeants (the loader and the gunner). The big disadvantage of this setup was that the tank commander had a secondary task: operating the radio. This meant that he could not fully concentrate on the battlefield. The new tanks first saw action on February 15, 1944, during the Korsun-Shevcheskovsk Operation. 5 IS-1 tanks were ordered to help the 109th tank brigade in the assault on Lisyanka village in Ukraine. 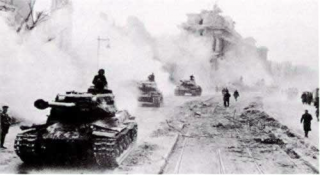 When the Soviet tanks approached within 600-700 meters, the Germans opened fire and knocked out all Soviet tanks. However, the village was captured the next day. 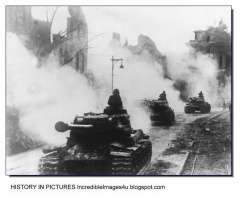 The first IS versus Tiger battle occurred on the first of March 1944. 1 IS-1 was destroyed and two were crippled after the German Tigers opened fire at a distance of 1500 to 1800 meters. Two Tiger tanks were damaged. 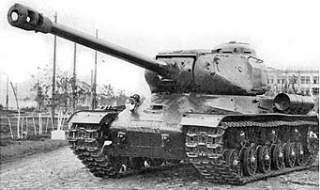 More IS-1s were damaged by artillery and field guns and as a result, the Soviet military demanded higher armor quality and the cancellation of the 85mm gun. The IS-2 was more successful. The 72nd regiment took part in fighting near Obertin between April 20 and May 10 and destroyed 41 Tiger I and Ferdinand tanks (it should be noted, however, that all German tank destroyers were labeled Ferdinand by the Soviets, most likely the Ferdinands were Stug IIIs in reality). Only 8 IS-2s were lost in the battle. The Tiger II and the IS-2 only met on a few occasions. Generally this encounters resulted in high losses on both sides. The first and most successful battle happened between a single IS-2 and 7 King Tigers. The IS-2 ambushed the Tiger IIs and destroyed three of them. The other four retreated. However, the main task of the IS-2 was not tank versus tank combat. The tank was especially potent against soft targets with its 25 kg HE shells. The appearance of the IS-2 meant the Soviets were now able to break through enemy lines defended by bunkers and AT-guns. 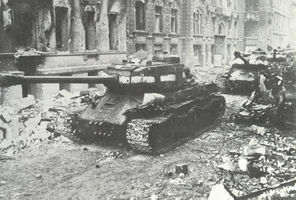 At the very end of the war, the IS-2 was successful as a breakthrough tank in the Battle of Berlin, as it was able to destroy buildings with a single shot. At that point in the war, the main enemy of the IS-2 was not the Panther or King Tiger, but infantry with Panzerschrecks or Panzerfausts. 70% of the IS-2s destroyed in that battle were destroyed with these kind of weapons. In May 1945, production of the IS-2 stopped in favor of the new IS-3. 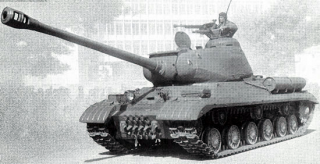 However, the IS-2 was used until the 1970s by the Soviet, Chinese, and North Korean army. The last time the IS-2 was used was during training in 1982, but the vehicle was only definitely scrapped in the 1990s. 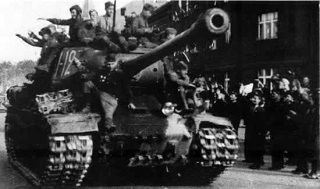 During the later stages of the war, the IS series was a primary Soviet tank, mainly used to break through enemy lines. It was the first Soviet tank that was able to face a Tiger or King Tiger one on one. In that role, it did not only have tactical value, but also acted as the model for the turn of the war. Soviet morale received a boost after the employment of these tanks. The IS-2 was on paper a Heavy tank, but it was more mobile and agile than its predecessor, the KV. Internal space was sacrificed for performance and cost saving. 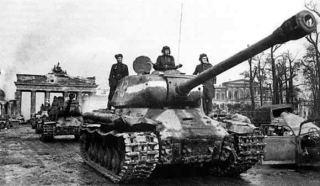 The IS-2 was the main tank in the final battle on the Soviet front, the Battle of Berlin. It proved to be an excellent fighter in the streets of the German capital. Crow, Duncan. "Tanks of World War II." Bookthrift Co, 1979. Print. Esta página fue modificada por última vez el 25 oct 2016, a las 11:07.